What’s In The Measles Vaccine? In the 1950s, 3 to 4 million people got measles every year in the United States. Scientists developed a vaccine for the highly contagious respiratory disease in 1963, and by 2000, the disease was effectively eliminated from American soil. But unvaccinated people continue to contract the disease. A particularly bad outbreak occurred in Ohio’s Amish country last year, infecting more than 300 unvaccinated people, and an exposure incident at Disneyland in California last month has already infected more than 100 people in 14 states, mostly children whose parents do not believe vaccines are safe. 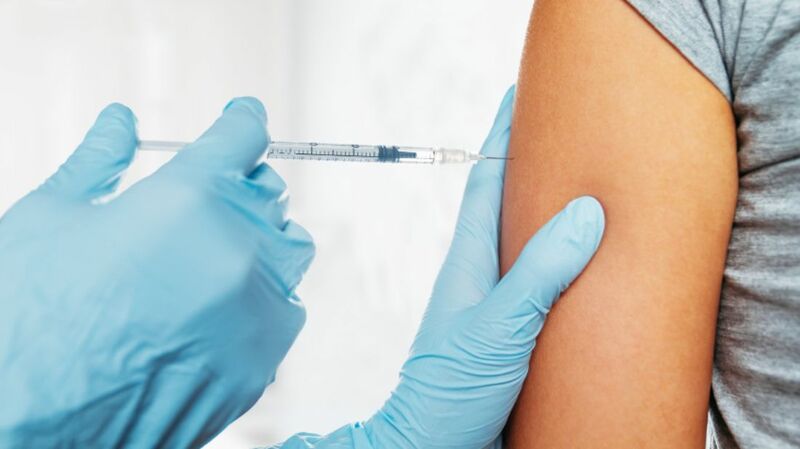 Pharmaceutical company Merck manufactures the measles vaccine in the United States. Each vaccine also includes inoculations against the mumps, another contagious disease, and rubella, also known as the German measles. Each 0.5-milliliter dose of the combo vaccine, known as MMR II, contains 10 ingredients. We chatted with Vincent Racaniello, a professor of microbiology and immunology at Columbia University, to find out what exactly those ingredients are and what they do. Racaniello has worked with viruses for the past 35 years. The strain of measles used for the measles vaccine, known as Edmonston, is derived from the original 1960s vaccine. Scientists use chick embryo cells to culture the virus. The liquid growth medium on top is known as Medium 199, a salt solution that includes vitamins, amino acids, and fetal bovine serum, plus sucrose, phosphate, glutamate, neomycin, and recombinant human albumin (more on those ingredients below). Mumps is grown the same way as measles: in chick embryo cell cultures and with the Medium 199 liquid growing medium. Rubella is grown in Minimum Essential Medium, a salt solution that contains vitamins, amino acids, and fetal bovine serum, plus recombinant human albumin, and neomycin. Sorbitol is a stabilizer. It is also used as an artificial sweetener in food. “It’s added to the vaccine to keep the viruses from falling apart as they’re handled,” Racaniello says. This protein is another component of the cell culture medium, which helps the cells grow properly. “Human albumin is found in blood,” Racaniello says. “Recombinant means it is made in a highly purified manner without contaminants.” To make the albumin, scientists put a gene for a human albumin in a cell and grow it in a lab. Once the cell produces the albumin, scientists can collect it and purify it directly from there, as opposed to stripping it directly from a blood sample, which could contain many contaminants. The vaccine’s ingredients include items that help it grow in the lab and help keep it together in a vial. So what happens to them once they’re injected into your body? Eventually the virus would spread throughout your entire body. “These are infectious viruses, so they would replicate in certain kinds of cells and produce more viruses, which would give you a really good immune response,” Racaniello says. “That’s why the vaccines work so well; because they’re infectious viruses.” Those viruses that your body produces will not give you measles or mumps or rubella, but they will alert your immune system to start making antibodies to defend against them. Then, if you ever got infected with measles or mumps or rubella, those antibodies would be there to block infection.